When Americans hear the word Kobe, they picture one of two things: Kobe Bryant from the Lakers basketball team, or “that really expensive beef in Japanese restaurants” (and in fact, Kobe Bryant’s parents named him for the dish after seeing the term on a menu). What makes Kobe beef so special? Is it the style of cooking? The method of raising the cattle? The location of the cattle? Or just really good marketing? For more than 1,000 years, Japanese people didn’t even eat beef; Buddhist influences forbade chowing down on anything with four legs. To be fair, a diet of rice, fish and vegetables is extremely healthy, and anyone who’s tasted good sushi can agree it’s not exactly a hardship! Kobe beef comes from Japanese Wagyu cattle, of which there are four types: Black, Brown, Poll and Shorthorn. Though exportation of the cattle used to be illegal, today, the animals are frequently raised in California (Harris Farms) and Australia, where land is much cheaper than it is in Japan. Farmers raise the cattle (including feeding it special grains) according to strict specifications identical to those used in Japan, and then ship the beasts back to Kobe for slaughter and preparation. No matter where it’s raised, all Kobe beef ultimately ends up in Kobe before being eaten. So how does it taste? And why is it sliced so thinly? Americans like to cut into a thick, juicy steak, but Kobe beef is best enjoyed seared, in extremely thin slices. It’s a delicacy comparable to foie gras; velvety and tasty. 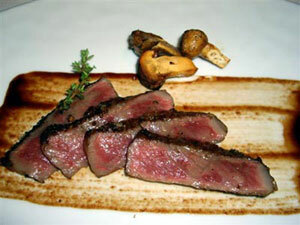 This is mainly due to Kobe beef’s marbled, unsaturated fat (sashi) and the slight sweetness of its flavor. Because it is so thin, not much cooking is required or even desired, which makes it perfect for Shabu Shabu. At Urasawa restaurant on Rodeo Drive in Beverly Hills, it is served as part of a $250 deluxe 17-course meal! 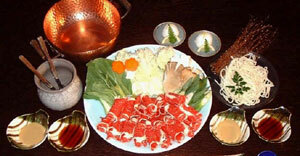 But you can also cook it up yourself in popular Yakiniku (barbeque) chains like Gyukaku. Don’t leave it in the boiling water for long! It cooks in seconds. And now I think I’ll go make a reservation for lunch! !